But a new puzzle involves the craters themselves. In the rough and tumble environment of the asteroid belt, ancient Ceres was certainly pummeled by numerous large asteroids during its 4.5 billion-year lifetime. But yet, there are just a few large craters on Ceres. “It is as though Ceres cures its own large impact scars and regenerates new surfaces, over and over,” said Dr. Simone Marchi, a senior research scientist at the Southwest Research Institute. Scientists with NASA’s Dawn mission were surprised to find that Ceres has no clear signs of truly giant impact basins. This image shows both visible (left) and topographic (right) mapping data from Dawn. Credit: NASA/JPL-Caltech/SwRI. Ceres has lots of little craters, but the Dawn spacecraft, orbiting Ceres since early 2015, has found only 16 craters larger than 100 km, and none larger than 280 km (175 miles) across. Scientists who model asteroid collisions in our Solar System predicted Ceres should have amassed up to 10 to 15 craters larger than 400 kilometers (250 miles) wide, and at least 40 craters larger than 100 km (62 miles) wide. By comparison, Dawn’s other target of study, the smaller asteroid Vesta, has several large craters, including one 500 kilometers (300 miles) in diameter, covering almost the entire south pole region. While they aren’t visible now, the scientists say there are clues that large impact basins may be hidden beneath Ceres’ surface. “We concluded that a significant population of large craters on Ceres has been obliterated beyond recognition over geological time scales, likely the result of Ceres’ peculiar composition and internal evolution,” Marchi said. 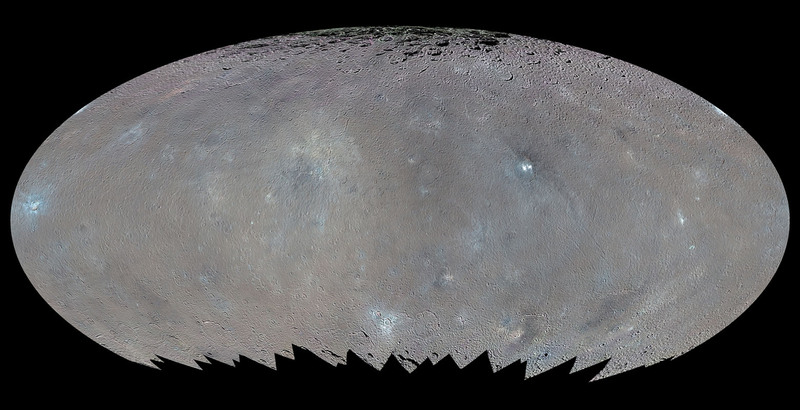 The top of this false-color image includes a grazing view of Kerwan, Ceres’ largest impact crater. This well-preserved crater is 280 km (175 miles) wide and is well defined with red-yellow high-elevation rims and a deep central depression shown in blue. Kerwan gradually degrades as one moves toward the center of the image into an 800-km (500-mile) wide, 4-km (2.5-mile) deep depression (in green) called Vendimia Planitia. This depression is possibly what’s left of one of the largest craters from Ceres’ earliest collisional history. Credit: SwRI/Simone Marchi. There are hints of about three shallow depressions around 800 km (500 miles) wide, and Marchi said they could be what are called or planitiae, or ancient impact basins, left over from large collisions that took place early in Ceres’ history. There are a few possible reasons why the big craters have been erased, and the scientists now have to figure out which reason or combination of reasons best explain their findings. 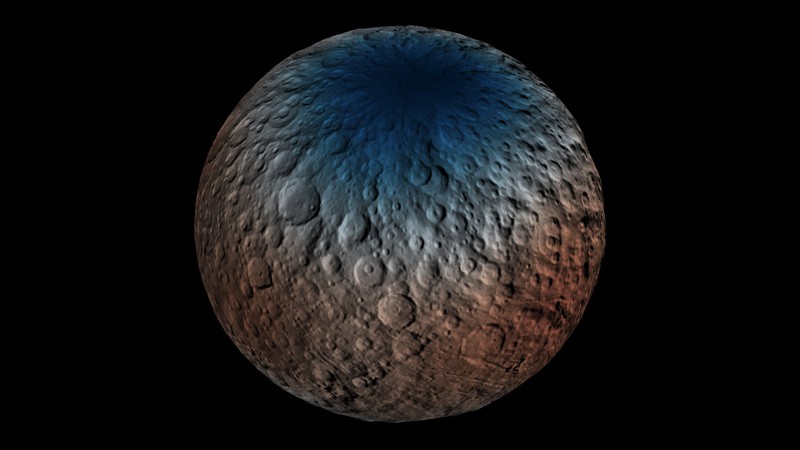 One reason could be because of large amounts of water or ice in Ceres’ interior, which has long been suspected. Does the absence of large craters lend any insight into Ceres’ water content? Marchi said the craters allow scientists to “probe” down to different depths, depending on their sizes, and that the missing large craters (greater than 100 km in diameter) can provide information on the properties on just the upper 100-200 km or so of Ceres’s outer shell. Because ice is less dense than rock, the topography could “relax” over time — like what happens if you push on your skin, then take the pressure off, and it relaxes back to its original shape, although this happened extremely more slowly on Ceres. The scientists said that over geological timescales of several million years the water or ice would slowly flow and the craters would smooth out. Additionally, recent analysis of the center of Ceres’ Occator Crater — where the largest bright areas are located — suggests that the salts found there could be remnants of a frozen ocean under the surface, and that liquid water could have been present in Ceres’ interior. A recent paper constrains the amount of subsurface ice to be no more than 30-40%. “However, the lack of large craters cannot be solely explained by the presence of 30-40% of water,” Marchi told Universe Today. Another reason for the lack of large craters could be hydrothermal activity, such as geysers or cryovolcanoes, which could have flowed across the surface, possibly burying pre-existing large craters. Smaller impacts would have then created new craters on the resurfaced area. 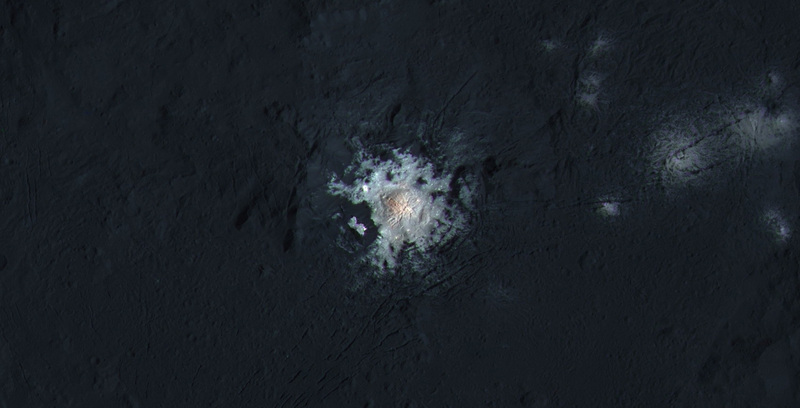 Hydrothermal activity has been linked to bright areas on Ceres, as well. Another reason for the lack of large craters is that smaller, later impacts could have erased the bigger older impact basins. But if that were the case, the older basins would seemingly be more visible than they are now. But the answer to this puzzle might all come back to the intriguing bright areas on Ceres. Marchi said the large crater obliteration was active well after the late heavy bombardment era, or about 4 billion year ago, so the resurfacing is inextricably linked to Ceres itself and its internal evolution, not impact events. Finding out more about Ceres’ interior is one of the more intriguing aspects of Dawn’s continued mission there. Marchi is lead author of the paper, “The Missing Large Impact Craters on Ceres,” published in the July 26, 2016, issue of Nature Communications. The Dawn spacecraft, NASA’s asteroid hopping probe, may not be going gently into that good night as planned. 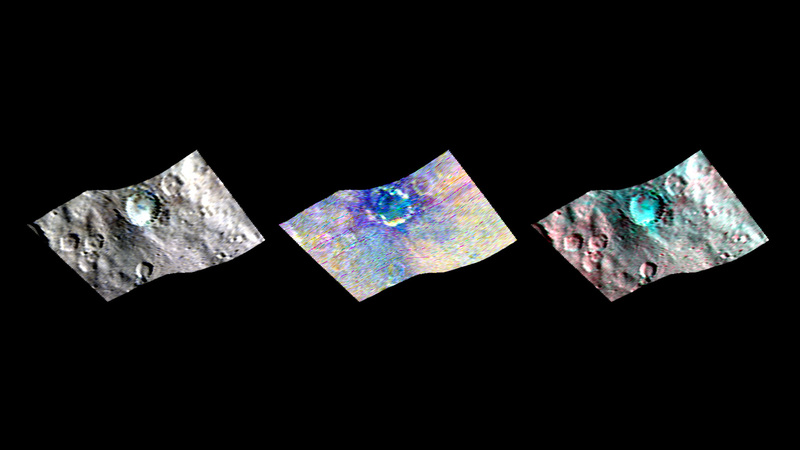 Dawn has visited Vesta and Ceres, and for now remains in orbit around Ceres. The Dawn mission was supposed to end after its rendezvous with Ceres, but now, reports say that the Dawn team has asked NASA to extend the mission to visit a third asteroid. Dawn was launched in 2007, and in 2011 and 2012 spent 14 months at Vesta. After Vesta, it reached Ceres in March 2015, and is still in orbit there. The mission was supposed to end, but according to a report at New Scientist, the team would like to extend that mission. Dawn is still is fully operational, and still has some xenon propellant remaining for its ion drive, so why not see what else can be achieved? There’s only a small amount of propellant left, so there’s only a limited selection of possible destinations for Dawn at this point. A journey to a far-flung destination is out of the question. If the Dawn mission is not extended, then its end won’t be very fitting for a mission that has accomplished so much. It will share the fate of some other spacecraft at the end of their lives; forever parked in a harmless orbit in an out of the way place, forgotten and left to its fate. The only other option is to crash it into a planet or other body to destroy it, like the Messenger spacecraft was crashed into Mercury at the end of its mission. The crash and burn option isn’t available to Dawn though. The spacecraft hasn’t been sterilized. If it hasn’t been sterilized of all possible Earthly microbial life, then it is strictly forbidden to crash it into Ceres, or another body like it. Planetary protection rules are in place to avoid the possible contamination of other worlds with Earthly microbial life. It’s not likely that any microbes that may have hitched a ride aboard Dawn would have survived Dawn’s journey so far, nor is it likely that they would survive on the surface of Ceres, but rules are rules. The secret of Dawn’s long-life and success is not only due to the excellent work by the teams responsible for the mission, it’s also due to Dawn’s ion-drive propulsion system. Ion drives, long dreamed of in science and science fiction, are making longer voyages into deep space possible. Ion drives start very slow, but gain speed incrementally, continuing to generate thrust over long distances and long periods of time. They do all this with minimal propellant, and are ideal for long space voyages like Dawn’s. The success of the Dawn mission is key to NASA’s plans for further deep space exploration. NASA continues to work on improving ion drives, and their latest project is the Advanced Electric Propulsion System (AEPS.) This project is meant to further develop the Hall Thruster, a type of ion-drive that NASA hopes will extend spacecraft mission capabilities, allow longer and deeper space exploration, and benefit commercial space activities as well. The AEPS has the potential to double the thrust of current ion-drives like the one on Dawn. It’s a key component of NASA’s Journey to Mars. NASA also has plans for a robotic asteroid capture mission called Asteroid Redirect Mission, which will use the AEPS. That mission will visit an asteroid, retrieve a boulder- sized asteroid from the surface, and place it in orbit around the Moon. Eventually, astronauts will visit it and return samples to Earth for study. Very ambitious. As far as the Dawn mission goes, it’s unclear what its next destination might be. Vesta and Ceres were chosen because they are thought be surviving protoplanets, formed at the same time as the other planets. But they stopped growing, and they remain largely undisturbed, so in that sense they are kind of locked in time, and are intriguing objects of study. There are other objects in the vicinity, but it would be pure guesswork to name any. We are prone to looking at the past nostalgically, and thinking of prior decades as the golden age of space exploration. But as Dawn, and dozens of other current missions and scientific endeavours in space show us, we may well be in a golden age right now.